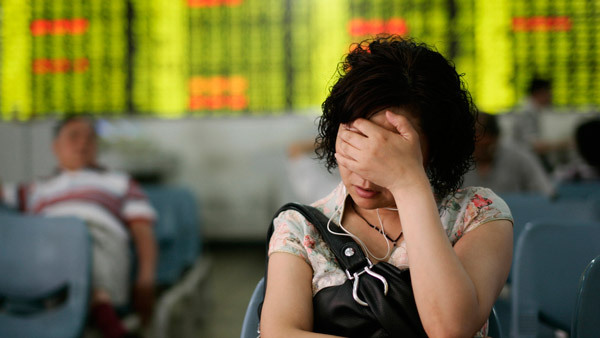 The Chinese stock market is crashing, unnerving markets around the world. But even after the losses, China's mainland markets are still up for the year. The Chinese stock market is crashing, unnerving markets around the world. Since reaching a 7-year high in mid-June, the large-cap Shanghai stock index (SHCOMP) has fallen over 32% and the small-cap Shenzhen index (SZCOMP) has plummeted 40% as of Wednesday’s close. As Chinese government efforts failed to slow the slide, the rout spread to Hong Kong and beyond. By midday Wednesday, the Dow Jones industrial average, already rattled by the ongoing financial crisis in Greece and a technical trading halt at the New York Stock Exchange, was down 208 points at 17,568. After Wednesday’s market close in China, about half the companies trading on the Shanghai and Shenzhen exchanges had voluntarily ceased trading in order to slow the rout. Over the weekend 21 Chinese brokerages, with support from the government, pledged to buy back stocks, to slow the decline, and the Chinese government announced a ban on new IPOs and pledged to provide liquidity to the state-backed China Securities Finance Corp., which lends to brokerages. All these moves followed a surprise interest rate cut in late June designed to slow the country’s stock market slide. But the decline continued, gainining momentum. But Chinese stock markets on the mainland, which trade so-called A shares that are primarily owned by everyday Chinese investors, kept falling, and the rout spread into Hong Kong. Its Hang Seng market, which had been faring much better than the mainland markets, lost almost 6%, its biggest drop since November. On Wednesday the government announced additional measures to stop the bloodbath, including letting insurers buy more blue-chip stocks and urging major shareholders and top executives of listed companies to buy their own shares. The Shanghai and Shenzhen indexes had more than doubled in price in the 12 months ended June 30, and even during the current rout they’re still up for the year. As of Wednesday’s close, the Shenzhen index is up 33% year to date, while the Shanghai index is up just 8.4%. China’s stock market is actually two separate markets: the A shares trading on the mainland, which recently became accessible for non-Chinese investors, and so-called H shares trading in Hong Kong. Until Wednesday, the Hang Seng index (HSI) in Hong Kong didn’t rally as much as the mainland markets and didn’t fall as hard. Now it’s down 17% since mid-June and off 3.6% year to date. Witherell’s firm, Cumberland Advisors, favors the Hong Kong market and invests in the iShares FTSE/Xinhua China 25 Index Fund (FXI), an equity ETF that tracks the Hang Seng index, and the SPDR S&P China ETF (GXC), which tracks the S&P China BMI Index, comprosed of Chinese ADRs (American depositary receipts) and GDRs (Global despositary receipts). Cumberland Advisors hopes to expand these positions but not until it sees that the Chinese market is recovering, says Witherell. Dodd Kittsley, head of ETF Strategy and national accounts at Deutsche Asset and Wealth Management, says it makes sense that investors want to take a more conservative approach, owning Chinese ADRs and H shares, but he questions whether that is the right approach for long-term investors. There’s a “long-term investment case” to be made for mainland China A shares, says Kittsley, “the best performing” stock market globally over the past year. His firm’s ASHR ETF, which tracks China’s CSI 300 index, composed of the 300 largest and most liquid China A shares, is down 5.5% year-to-date but up 57% over the past year. Its ASHS ETF, which tracks China’s CSI 500 small-cap Index, is down 7% year-to-date but up 41% over the past 12 months. “This is a market that is evolving rapidly,” says Kittsley. ‘It’s not on the radar screen for a lot of individual investors but it will be in five or 10 years.” He likens the evolution to what happened to emerging markets previously. Vanguard is actually marrying both markets in a way. Last month it announced that its Emerging Markets Stock Index Fund (VEIEX) and related FTSE Emerging Markets ETF (VWO) will add Chinese A shares later this year. MSCI is also considering adding China A shares to its global indexes but only after it resolves some outstanding issues with the China Securities Regulatory Commission. “China will be become a bigger portion of mutual fund portfolios as more A shares come on line and become more accessible … but that will happen over time,” says Bill Rocco, senior fund analyst at Morningstar. He suggests that investors avoid buying any country-specific fund, including a China fund, and invest instead in a diversified emerging market fund, which will provide plenty of exposure to China. The MSCI Emerging Market index, for example, has a 25% weighting in China.